What makes a garment a classic? Is it the wear-everywhere silhouette? The neutral go-with anything color? This season, redefine what you thought was a “classic” with the Diagonal Rib Sweater. Made with wool in neutral color, eggplant (yes, purple is a neutral!) this sweater is the perfect winter pregnancy staple. The diagonal detail across your bump highlights your best accessory, and the ribbing texture helps you to #growinstyle. Best of all, you can wear it post-preggers too. Expand your working wardrobe by pairing a make-your-own suit with not just a shell under the jacket but with a sweater. The Diagonal Rib Sweater pairs with our Ponte Straight Skirt and your pre-preggers blazer for your corner office style. Top with chunky pearls and your everyday black pumps. Go ahead and ditch the jacket if your work environment allows, so you can show off your bump a little bit more. Then strut your stuff and nail that client meeting. Sunday brunch is all about effortless chic so top your slouchy, ripped jeans (maternity version or not) with the Diagonal Rib Sweater. Push up the sleeves for that nonchalant vibe and leave your hair loose and wavy. Step into some slip ons (we’re a fan of these Michael Kors or Vans makes some cool textured ones too) for some cool comfort and accessorize with an armful of bangles. You’ll be ready to enjoy those virgin mimosas or bloody marys with the girls in no time. 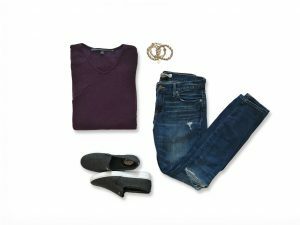 A cool sweater can even get dressed up to go out if you style it right. Rock out the Diagonal Rib Sweater with some leather accented leggings and an over-the-knee boot. The leather detail gives the sweater some nighttime style and the over-the-knee boot adds a little sexiness. Depending on your sciatica, ‘er style, the boot can even be heeled or flat, you pick. Wrap a thin 70’s style scarf around your neck and slip on a big, bold, statement ring. Then ask for a virgin cosmo but in a martini glass and freak everyone out at the bar. There are a thousand other ways to wear the Diagonal Rib Sweater so play with your current mood, style and wardrobe. The point is, keep an open mind and be creative! Always remember to #growinstyle.